Your Android Smartphone has tons of amazing features and functions. The enormous success and popularity of Android can be attributed to the fact that almost every function on the smartphone is customizable to suit your preference. One of the many customizable features in your smartphone is the keyboard. The inbuilt stock keyboard on Android phones is stable and functional but third-party keyboard apps give the user more freedom in terms of design and customizations. There are keyboards that offer shortcuts that let you type faster, while others that have incredible predictive functions which make texting very easy and intuitive. If you want something more than the stock keyboard, our list of best Android keyboards can help you pick the one most suited to you. These apps are rated amongst the best Android keyboards and have a slew of interesting features. The android keyboards in this section have the best overall features. They offer customizations; they are easy to use and are robust apps that making typing a breeze. 1. GBoard: GBoard is the updated Google Keyboard, which has some great features. It is fast and minimal and offers a few customizations. Developed by Google for iOS, the GBoard surprisingly came to Android much after it was released for iOS. Nevertheless, it is one of the best keyboard apps available, and if your phone does not already have it, make sure you install it from Play Store. What we like: It is a free keyboard app and has some great features such as GIF search, Google Translate, and gesture typing. It is fast and reliable and is considered to be a solid and robust keyboard app. 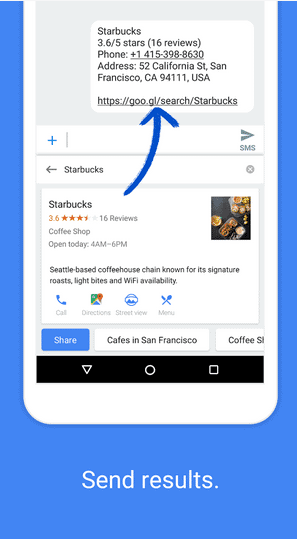 What we like the best is the integrated Google search; you don’t have to exit the app to search for anything now, you can search right from your keyboard. What we don’t: It is hard to find things we don’t like about this keyboard, but there is always something missing in an app. The number of themes in the app is limited and could use a refresh there. 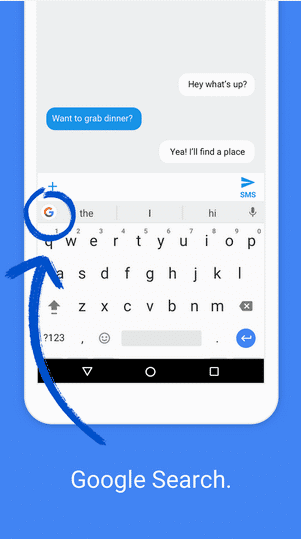 GBoard is not the best app for predictive texting but it learns from your typing across all Google services and apps, so that is another area where we can use some improvement. Our verdict: If GBoard is not your default keyboard, check compatibility on the Play Store and download it right away. It is by far the best and the safest keyboard app. You don’t have to worry about adware and malware on this app since it comes from directly from Google, making it one of the safest and best android keyboard apps available today. 2. 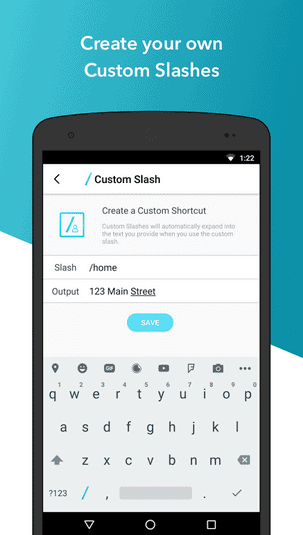 Slash: Slash is a great keyboard app with multiple features. 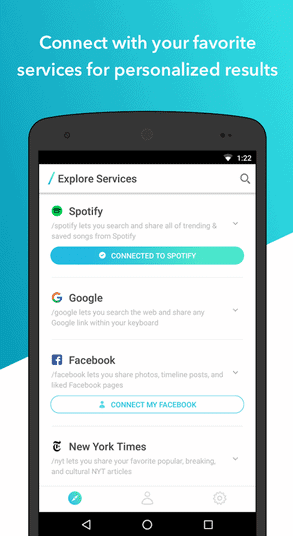 This keyboard connects with third-party apps like Spotify, Facebook, YouTube etc., for personalized results. It has several themes for customizations and like GBoard lets you search straight from the keyboard. What we like: Slash keyboard allows you to customize your own typing shortcuts, which is a boon for those pressed for time. Creating custom slashes or typing shortcuts is very easy and you can create as many as you like. It easy to share files, pictures, songs etc., straight from your keyboard. What we don’t: Again, there’s very little not to like about this app as it is a good keyboard for Android smartphones. A little improvement on the predictive texting feature would be welcome. Our verdict: If you are looking for a robust app other than GBoard, this is the app to go for. The developers assure us that it is completely safe and they do not record anything you type or transmit data of any kind. It is a feature-rich keyboard app that is great for boosting productivity. Predictive texting is a great feature where the app suggests the next word or phrase based on what you have already typed. The app learns from your typing patterns and suggests words accordingly. Predictions are also made based on the context of what you have already typed. As you can imagine, predictive texting is a great boost to productivity and speed. 1. SwiftKey: SwiftKey is one of the most popular Android Keyboard apps today and is perhaps the most used after Google Keyboard. The predictive text on the SwiftKey Keyboard is truly remarkable, the best so far. SwiftKey keyboard has a good security policy that actually differentiates data while you are typing and separates sensitive data like passwords and credit card details from normal texting. What we like: Definitely like the predictive texting; it’s fast and dependable. The best part of SwiftKey’s predictive input is that it improves over time. It learns your texting patterns to predict more accurate words and phrases over time. There are a few themes and layouts that let you customize your keyboard according to your preferences. What we don’t: SwiftKey is not the lightest keyboard app available and requires a high-end processor and memory to work well. On older phones, SwiftKey is slow and sometimes laggy. Our verdict: Predictive text simplifies the process of typing to a large extent. Not only is it great for productivity, it is also extremely user-friendliness well. 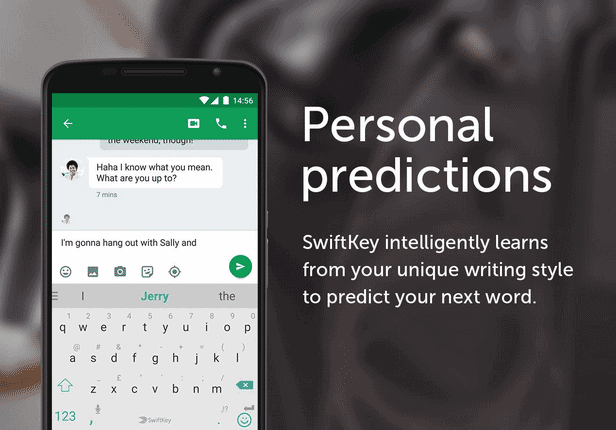 Download SwiftKey keyboard for your Android smartphone if you are a big fan of predictive text. 2.Minuum: Minuum is a fantastic keyboard app full of interesting and user-friendly features. It has great predictive texting abilities as well as lots of customizable features. 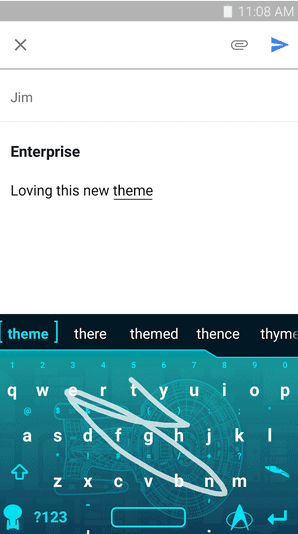 What we like: This Android keyboard app has a lot of features that make typing a piece of cake. There’s the space-saving feature where you can minimize the keyboard and to as small as a single row. Another interesting feature is the floating keyboard which is also space saving. The app suggests emoji based on the context and has robust autocorrect and predictive functions. You can type as sloppily as you want, the app will still give you good predictions. What we don’t: The learning curve for this keyboard in its minimized form is a little steep and you have to stick to it to learn how to use some of the features. Our verdict: Minuum is a great keyboard app for Android because it is packed with great features and customizations to make typing very easy. It supports 13 languages and has special layouts for people with large fingers. Gesture-based keyboards considerably speed up the typing process by letting you swipe across the keyboard instead of tapping on individual keys. These keyboards let you type with amazing speeds and great accuracy. 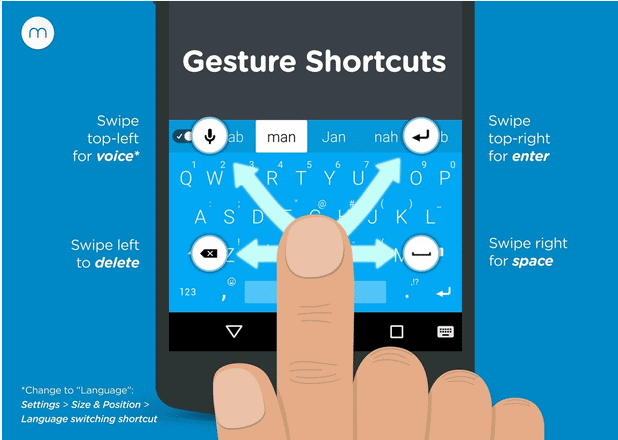 1.Swype: Swype is the original gesture-based keyboard for Android. It learns from your typing patterns to come up with accurate predictions. It is super-fast and makes texting easy and convenient. What we like: The Swype keyboard is very fast and elegant. It has customizations and themes. You can develop a personal dictionary with this app with words that you use often. It supports many languages; even two languages at the same time. One of its best features is the gesture shortcuts for everyday tasks. What we don’t: There are few update issues on the app and there have complaints of lag and memory issues. Our verdict: The Swype keyboard is perfect for those who use the swiping gesture comfortably. Its customizations and gesture shortcuts make it a good Android keyboard app. 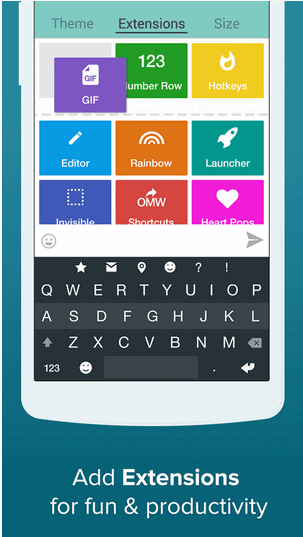 2.Fleksy: This keyboard app has tons of customization features and a brilliant auto-correct function. It has a highly developed word suggestion system that makes it easy to use. 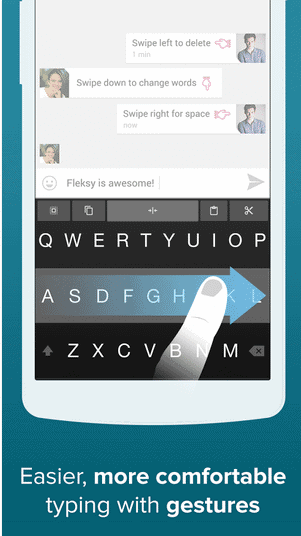 What we like: Fleksy is one of the fastest and most efficient android keyboards on Play Store. 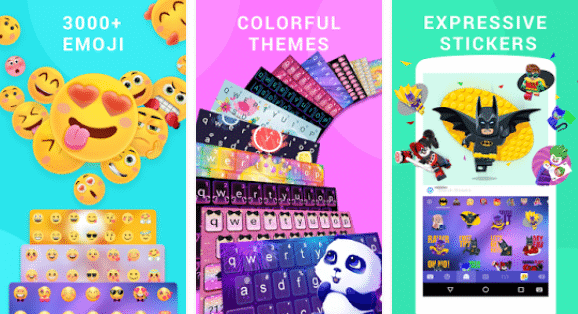 It has many beautiful themes and gifs and stickers to choose from. It incorporates intuitive gestures for faster typing. What we don’t like: A little heavy on the phone’s resources. Our verdict: Fleksy keyboard uses accurate next-generation autocorrect that lets you type at super-fast speeds without errors. It is highly customizable with custom extensions for more functionality. The best keyboards for android phones offer unending customizations to suit every need. Customizations like the look and design, the user interface, the key layout and shortcuts all add up to a better user experience. 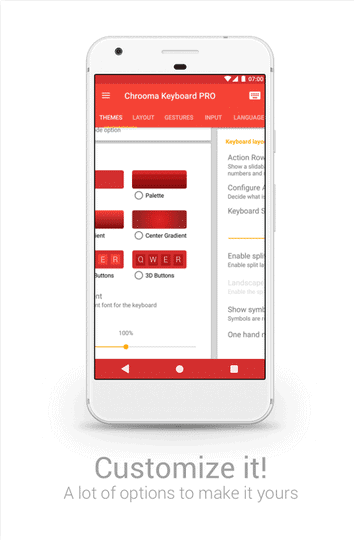 1.Chrooma: Chrooma is one of the most customizable keyboard apps for Android today. The paid app lets you unlock all its features, but the free keyboard also has many customization tools. What we like: The app has a simple night mode for night-time usage. This Android keyboard app lets you access the settings option right from the keyboard. 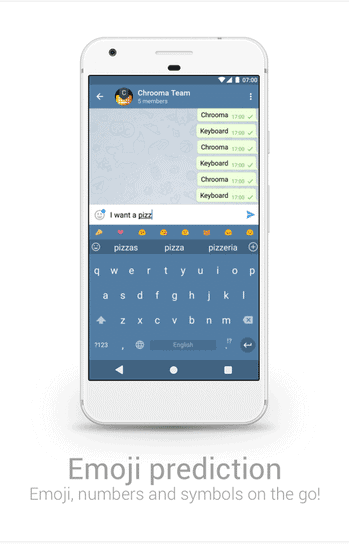 It has GIF search and emoji support integrated with the keyboard to make your texts fun and interesting. What we don’t: The keyboard app is a little slow on older phones. Our verdict: You can personalize your Chrooma keyboard from the large number of themes, fonts, keyboard sizes, emoji styles etc integrated in the app. This Android keyboard app is great for someone who wants more features in their keyboard. 2.MultiLing O: The MultiLing O keyboard app for Android supports more than 200 languages. It has customizable layouts, designs, and emojis. What we like: With this keyboard, you can choose the appearance, position, keyboard size and other features of the keyboard according to your preferences. This app supports more than 200 languages. What we don’t: The customizations take a little time to master and the word prediction is not very accurate. Our verdict: This is a good app to consider if you type in multiple languages. It is light in size and works well on low-end phones too. The keyboard does not use your internet connection to work, thus making it one of the safer keyboard apps for Android. It is normal to use emoji and gifs to express your feelings in a text or email these days. The popularity of emoji is such that many Android keyboard apps have a GIF search and an emoji menu integrated into them. 1. 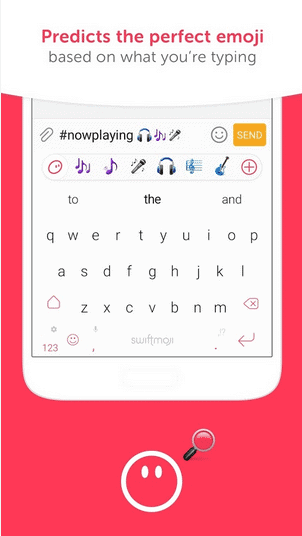 Swiftmoji: This is one of the best android emoji keyboard apps from SwiftKey and it gives you predictive emoji based on the words and the context of the words that you are typing. What we like: With this emoji keyboard app for Android, you don’t have to look for emoji inspiration anymore. They will come to you as you type. The keyboard can be resized according to your preferences. What we don’t: Unlike the original SwiftKey app, this app does not offer up too many customizations. Our verdict: If you are the kind of person who knows and loves all things emoji, this is one of the best emoji keyboards for Android today. 2. Kika Emoji Keyboard: The Kika Emoji keyboard features over 3000 emoji, emoticons, and smiley faces. 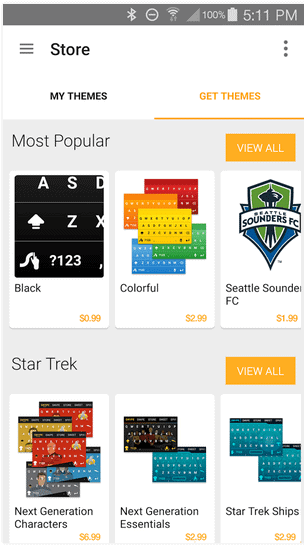 It is free to download and supports customizable keyboard themes. What we like: This Android keyboard app has a powerful contextual prediction as well as support for more than 3000 emoji and gifs. You can customize the keyboard from more than 100 beautiful themes. The app supports gesture typing and has smart autocorrect and word prediction abilities. What we don’t: This keyboard app is not always stable and sometimes the emoji don’t work. Our verdict: A good emoji and gif keyboard app for Android, the Kika Emoji Keyboard is a nice app to have if you want to intersperse your text with offbeat and never-seen-before emoji. 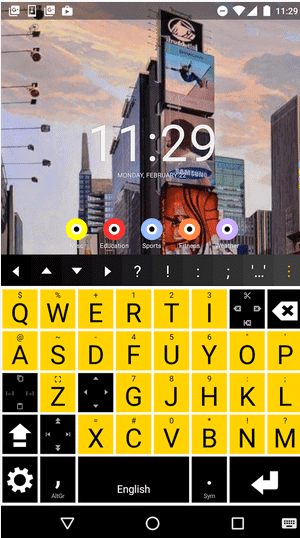 These keyboard apps for Android are innovative and do not follow the usual qwerty layout. They are quirky and innovative, and once you get the hang of it, very fast. 1. Google Handwriting Input: If you hate typing with the tiny keys on your smartphone keyboard, handwriting input is the way to go. 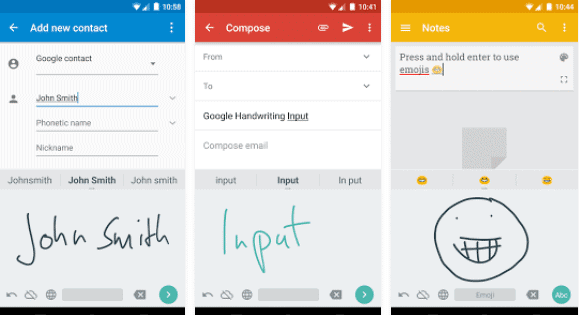 Google Handwriting Input works with or without a stylus, with print as well as cursive and supports hundreds of emoji. What we like: It is a fun way of entering text, especially for those who hate to type. You can even draw an emoji and press enter for it to appear on the screen. It is useful for languages that are challenging to type on a normal keyboard and for seniors who don’t like typing. What we don’t: It is not a particularly fast or efficient method of input. Our verdict: The Google Handwriting Input is fun to use if you have plenty of time to compose your message. 2. 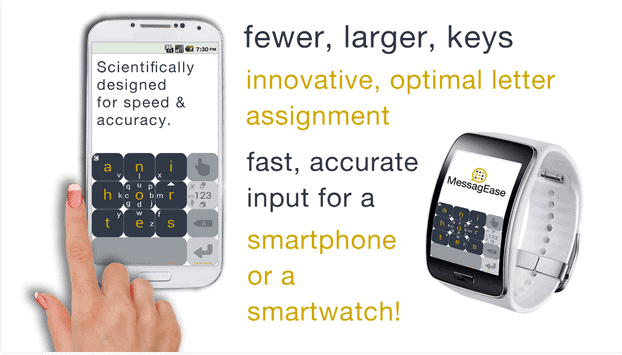 MessagEase: This keyboard app for Android is very different from your usual qwerty keyboards. It is an innovative keyboard created especially for use with touchscreen phones. It is a revolutionary app with just 9 large keys designed in a way so as to maximize your speed and ease your writing. What we like: It is different, no doubt, and it aims to change the way we type on our smartphones and wearables. Once you get the hang of it, typing is faster and more intuitive with this app. It is optimized for use with smartphones and smartwatches, and you need just one finger to type. What we don’t: The learning curve is steep here and you’ll need some time to get the hang of all the gestures and shortcuts. Our verdict: If you like trying out new apps with innovative features, you should give this app a try. It supports multiple languages and the developers claim that typing on this keyboard is much faster than any qwerty keyboard. 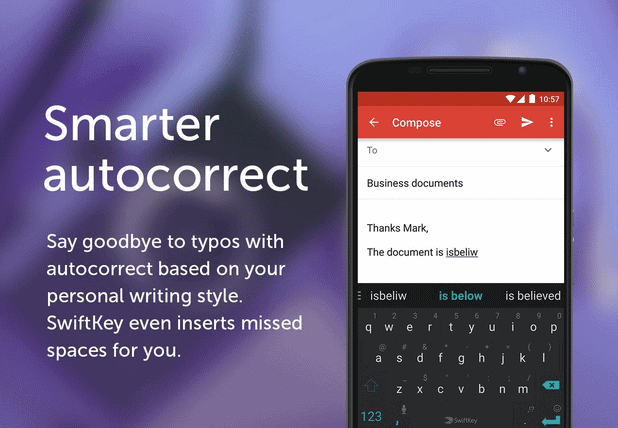 These are some of the best keyboard apps for Android smartphones on the Play Store. Have you tried any of these? Which is your go-to keyboard app?